Join the discussion on our forums! 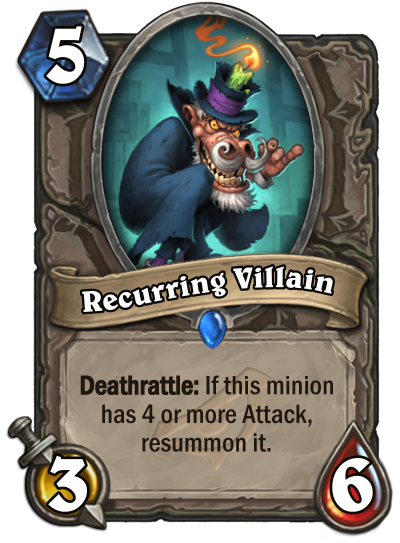 Come discuss Recurring Villain over in our dedicated Recurring Villain discussion topic. Mwahahaha! You'll never catch him this time! This card is amazing :D sleeper of the set. I just wish I could generate a few copies directly on board or to my hand. what happens if I play this when I have Spiritsinger Umbra and Sneaky Devil on board? yes, I just tested it for myself too, it does! I will try to create a deck around that combo then. It never dies. Quest Rogue only waits in the shadows. Combine with Sneaky Devil for fun times! The art is so good it makes me smile :) what a cheeky little bugger! But would it work with Immortal Prelate? Nope, the only one who keeps the deathrattles is the one who goes to the deck.